Upper-class neighborhoods are hardly safe from the bed bug scourge. 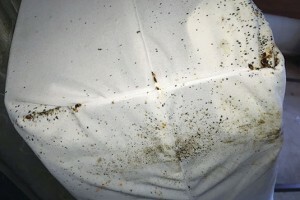 We do a great deal of bed bug work in the Atlanta area. Because of that, we possess a lot of electric heat equipment, which was the desired type of treatment for the job I’m about to describe. The house is probably worth between $1.5 million and $2 million, as it’s just down the road from the governor’s mansion. It’s a six-bedroom home, and the owner is an elderly woman suffering from dementia. Her son moved into the house to help his mother out. Unfortunately, this resulted in him transporting bed bugs from his prior residence over to Mom’s. When I arrived and he opened the door, I looked in before entering. I could see bed bugs and bed bug excrement on the ceilings and drywall from the front door. It turns out the son first had them in his bedroom. He then moved into another bedroom — and of course, they followed him there. He kept moving until he ran out of rooms. Now he was sleeping on the den couch. He offered me a seat, but I said, “No thanks. I’m good.” I went to the couch, gently pushed on a cushion and bed bugs poured out from every seam. Every room was totally infested, including the kitchen. It was one of the heaviest infestations we’d witnessed. We began discussing treatment preparations with the son, with an immediate focus on clothes. I also noticed a very expensive-looking grand piano that might need to be removed and retuned after treatment. The son, however, assured me he had no idea how to play a piano, so he was happy to sign a “piano waiver” with his contract for treatment. It took two days to prepare the house and two crews to do the job, providing thermal remediation heat treatment throughout the entire house. The process lasted nearly eight hours, but we successfully completed it. When it was all over, there were literally thousands of dead bed bugs everywhere. We tried to vacuum them all up, but there were almost too many to successfully complete such a task. It was a profitable job, but very challenging due to the amount of activity present. We were glad to be able to help, but we hope future clients are a little more proactive and call before things get so outrageously out of hand. Garey Clark is the owner of Clark Pest Remedy in McDonough, Ga. He can be reached at gclarke@clarkpestremedy.com.